Sharpen those colored pencils! Grab those Crayola crayons! 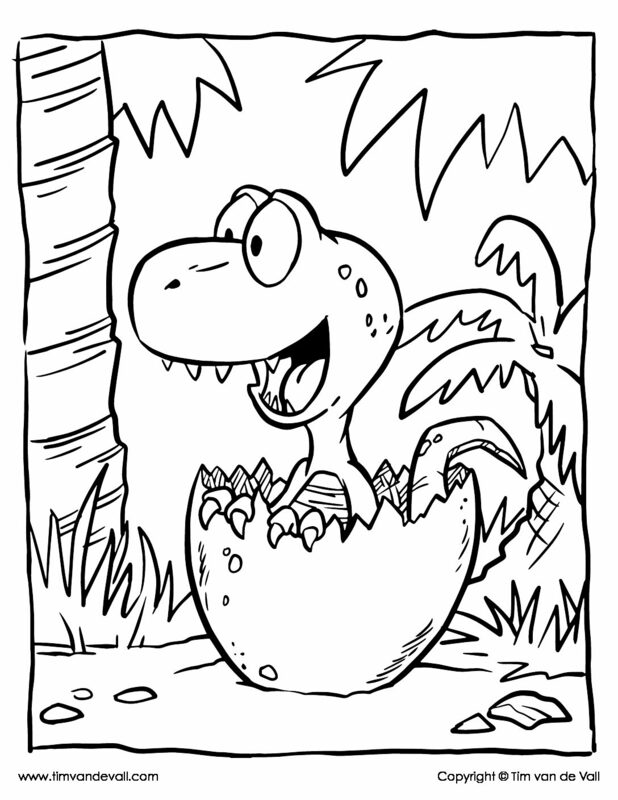 Here’s a free printable baby dinosaur coloring page, depicting a little T. rex breaking out of its egg. This printable is one of several dinosaur activities available on Tim’s Printables. While your kids are working on their baby dinosaur coloring page, teach them a bit about dinosaurs with this list of fun facts. Dinosaur fossils have been discovered on all 7 continents, including Antarctica. The fastest dinosaurs were known as ornithomimids. They could run up to 60 kilometers per hour! (36 miles per hour) If you’ve ever seen Jurassic Park, a flock of ornithminimids, known as gallimimus dinosaurs, are seen running across the fields to escape the tyrannosaurus rex. Brachiosaurs were the one of the tallest dinosaurs ever found. The tallest dinosaur that ever lived is believed to be the Sauroposeidon. Unfortunately, very few fossils have been found of this dinosaur.